Nowadays many web sites use counters and web statistics tracking systems that generate statistics about what happens on the site. For example, they can track site visitors, monitor what type of links are used and what files are downloaded from the site. However, you may need to skip such services during your tests. WAPT Pro allows you to specify the list of URLs that will be ignored during the recording process. Add mask..: Click this button and specify an URL that should be ignored during recording. If you enter some URL string, Recorder will ignore all URLs beginning from that string. You can also use wildcards (* and ?) to define the whole domain of URLs that should be ignored. IP: You can specify an IP for Recorder proxy. Select the necessary value in the combo-box where you can see all IPs available on your system. 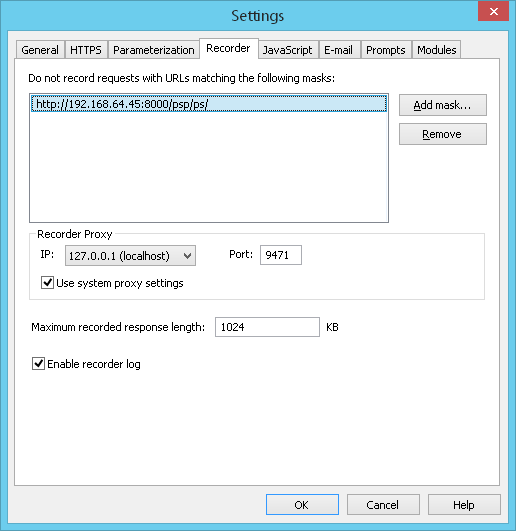 Port: It is the default port number used by Recorder proxy. Use system proxy settings: If this option is switched on, then Recorder proxy takes the current system proxy settings and uses them to establish connections. In this case WAPT Pro Recorder works as a proxy between the server being tested and web browser. In particular, if there is one or several proxy servers on the way to the server being tested, then WAPT Pro Recorder proxy is incorporated between the web browser and the first proxy server in the chain. When you stop recording (click the Stop Rec button), all system settings are restored to their initial state. If you turn this option off, then Recorder will connect to the server being tested using a direct connection (without using a proxy server). Maximum recorded response length: Using this option you can limit the length of recorded server responses. The specified value defines the maximum length of any response received from the server during recording (without images). If the length of some response exceeds this value, the end of that response is cut off. Besides, if you change the value in this field and click "Save" on the toolbar, then this value will be applied to already recorded responses. They will be cut off if their length exceeds the specified value. So, this option is applied during recording + during saving the recorded profiles. Enable recorder log: Check this option to save a log for Recorder. Log file will be saved to "c:\Users\UserName\AppData\Roaming\Softlogica\WAPT" folder ("UserName" means a user under which WAPT Pro is currently running).